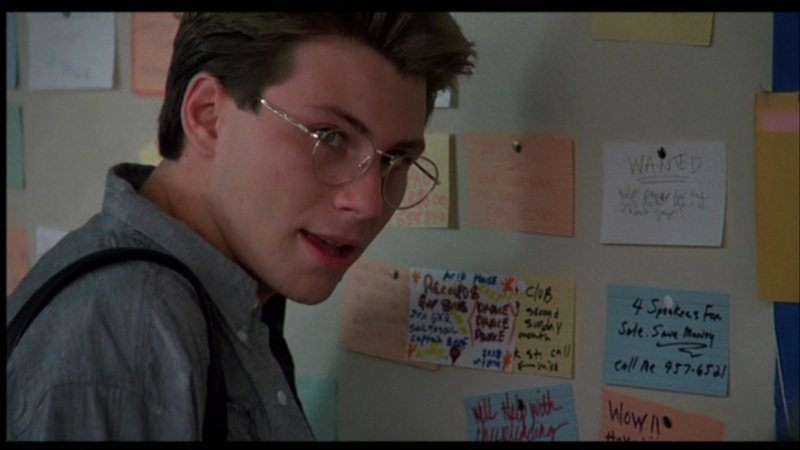 Since Christian Slater has been on my mind and my television this week (see yesterday’s post on USA’s Mr. Robot), I decided to feature him in this week’s throwback film rec. Many Slater films rushed to mind as candidates, like the early Tarantino screenplay True Romance (1993) or the satire that made Mean Girls (2004) thinkable, Heathers (1988). In the end, I’m going one tick more obscure to 1990’s Pump up the Volume. Pump Up the Volume was never a huge hit but was well reviewed is still held dear by many. It comes toward the end of what I’d call the “meaningful-film-for-and-about-teenagers” cycle that includes all of Molly Ringwald’s oeuvre, and, say, the first few tastes of Patrick Dempsey (then the big-nosed, good guy, not McDreamy), Winonna Ryder, and, yes, Christian Slater. Slater’s Mark is the loner kid at his suburban Phoenix high school. At night, however, he transforms from the glasses wearing shy guy, to the shirtless, smoking, and swearing underground DJ known as “Hard Harry.” Mark is broadcasting a pirate radio show out of his basement that features edgy music and his edgier rants about American society and against the powers that be in his town. With this performance, Slater further solidified his persona from Heathers: the teen heart throb whose appeal was one part charisma and one part chaos. One of the things that perhaps endears this film to me most is its shy-kid-by day, social-critic by night main character. In many ways, Mark/Harry is a prototypical pop culture representation of the teen hacker–the criminal who isn’t really a criminal, the too-smart teenager with righteous (if not really harmless) anti-establishment leanings. Yet, the technology involved in Pump in the Volume is FM radio. This gets us a pretty credibly niche movie soundtrack for 1990 and scratches my itch for the days of analog living, when getting the attention of adults and teens in your own town was a feat to be reckoned with because–sweet forbearance–there was no YouTube or Twitterverse full of fifteen-minute-seekers. The film’s no-cell-phone-no-internet-as-we-know-it back drop is quaint in a sense and yet also preserves its characters’ radicalism, maybe even enhances it since Mark’s attention-seeking media piracy is for social change in a totally un-hashtagged way that brings him no social benefit … except for one hot brunette. In the early to mid-90s I was a loner-ish teenage gal myself, and–like Slater’s love interest–a brunette who wore blazers. So while I found the plot a little over the top, it was also absurdly appealing. Ah, the fantasy of some awkward kid who would reveal himself implausibly deep for seventeen and, of course, totally into girls with short brown hair and a penchant for menswear. It was flattering in a way that was quite life-affirming at the time. It was a VHS well worth the $1.50 rental. I also, however, vividly remember being scandalized when his girlfriend shows up to see him and is <<gasp>> braless. I mean, can you imagine? Bra-less. At this point in my personal history, I’m just barely over the fact that I have to wear a bra all the time, that I must bow to propriety on this matter for the rest of my life lest I incite too much of either my own embarrassment or some boys’ attention. And then, then Hard Harry’s girlfriend shows up and takes her top off (people do this?!) and–hussy!–doesn’t even have a bra on underneath!! It boggled the mind. Let this also serve as your warning that this is not nearly so innocent a film as Sixteen Candles or even Say Anything. Harry is, well, more of a bad boy than those films would allow. A 90s artifact worth adding to your cache.